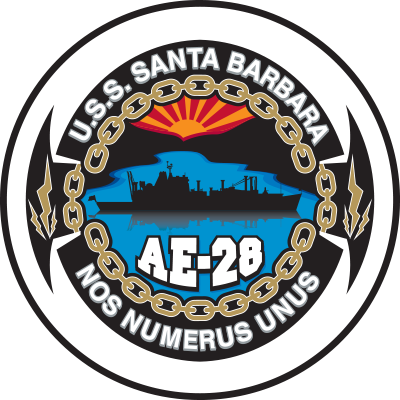 The Name Carries Special Significance for an Ammunition Ship. It is the same name as the City of Santa Barbara, California, where a mission was raised for Santa Barbara, a third century martyr and patron Saint of cannoneers and ordnance men. In addition, Santa Barbara is a historically active volcano on Terceira Island in the Azores (U.S. Navy ammunition ships are frequently named for volcanoes). The lightning on the protective banner is symbolic of the protection Santa Barbara gives against flame and lighting. The mountains and sun are borrowed from the official seal of the City of Santa Barbara, representing the natural beauty of the Southern California city. “Nos Numerus Unus,” which means “We are number one” in Latin, is a very fitting description of the ship and her crew. Their intense pride in their ship is exemplified by the professionalism they display in their work.